Oh, great. I think you have a treat in store with this. I’ve only read a couple of Trevor’s stories — both published in journals, I think — but they were very impressive. One of his late novels, Love and Summer, is excellent too, beautifully observed. That’s a good point about the overlooked. Pym’s novels often focus on people on the fringes of life, and the same is true here to a certain extent. Plus the clothing clear-out scene is just the type of comedy of errors that she excels at, what with her sharp eye for detail and fondness for jumble sales and the like. I read this one earlier in the year and I have to say that it is brilliant. I found Mr Bird’s motives confusing though as he seems to have spent his life helping these unfortunate and pathetic characters only to torment them when he died. I was surprised, but liked, the dramatic ending. I have also read ‘Mrs Eckdorff’ this year which is nearly as good. I intend to read much more by Trevor. Oh, that’s really interesting. I’ll definitely take a look at your review if there is one – it might have been while I was offline earlier this year as so much passed me by back then. Yes, I know what you mean about Mr Bird, although he definitely seemed to have set things up to cause a hell of a lot of friction after his death! What larks. I loved the characters here, particular Mr Studdy and Nurse Clock. There was another quote about them that I nearly put in, but it just would have made the whole post ridiculously long (and it’s probably still too long as it is). Oh well, if anyone is interested I’ll add it to the comments below. Yes, I actually have reviews for BH and Mrs Eckdorff. Both of these were books I got from my local library; they also have The Love Department which will probably be my next Trevor. I have some copies of his other books as well. It would have been nice knowing about his work earlier but this way I have all his work to look forward to. Cool. I’ve just left a comment on your very fine review of The Boarding-House. How funny that we both ended up reading it this year. I think I bought my copy a year or so ago, just after Penguin reissued his books in those smart black and white editions. The Love Department sounds great too. I have a different Trevor on my shelves — The Old Boys — a recommendation from a like-minded reader on Twitter, so I’m hoping that will be my next by him. The Old Boys does sound good. I read The Children of Dynmouth last year which I thought was excellent as well. I’m sure at some point I’ll come across a book of his that I won’t like but hopefully not for a while yet. I remember your review of The Children of Dynmouth. The book has a seaside setting, doesn’t it? Well, at least that’s my impression of it from memory. Love and Summer is another good one, beautifully observed and very subtle. The tone is very different to that in The Boarding-House, more delicate and sympathetic. I liked it a lot. This sounds like a wonderful piece of mischief, very different from Trevor’s The Strory of Lucy Gault – one of my favourite novels and one of the saddest stories I’ve read. I can understand the attraction of the boarding house setting. I’m attacted to novels set in apartment buildings which act as a micrcosm of society. It’s very wicked in more ways than one! I haven’t read Lucy Gault (or Felicia’s Journey for that matter), but I suspect the tone of this one is quite different – as you say, more mischievous. Yes, the microcosm-of-society idea really appeals to me too, which is probably why I also love hotel novels so much. Vicki Baum’s Grand Hotel is a great example of that genre where some of the characters are on the up while others are slipping down. Yes, I loved the characters here – they’re such a mixed bag, but all very well-drawn even down to the minor players like Gallelty and Mr Venables. I think you would really like this one, Ali. The setting is terrific, and there’s so much to enjoy in the dynamics between the characters. In some ways, I was reminded of Elizabeth Taylor’s work, particularly Mrs Palfrey and The Soul of Kindness. Plus that clothing scene is straight out of a Barbara Pym. All in all, a wonderful novel. Great review as always Jacqui. 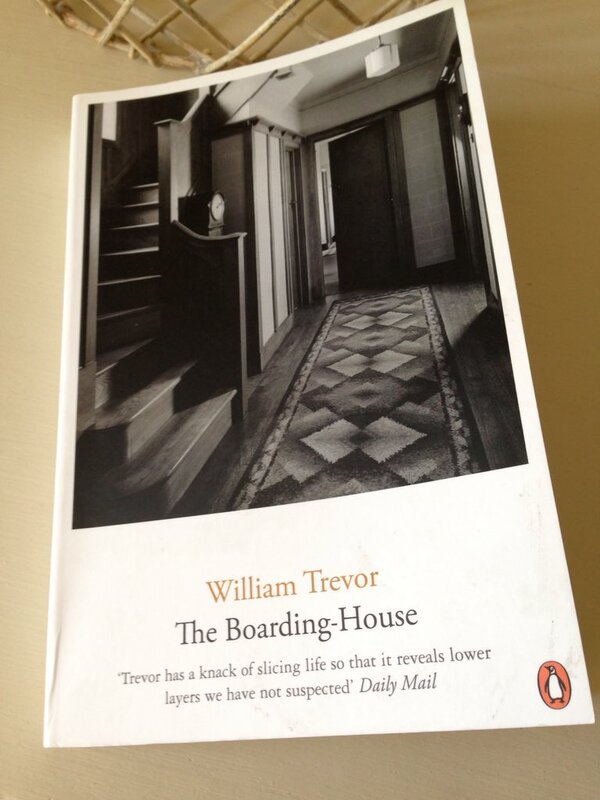 I do not think that I have ever read a boarding house novel. Yet I can see how they can create great settings for fiction. There are a lot of variations out there where characters end up living together under seedy or unusual conditions. As for this book, it sounds very good and the characters very well crafted. If you’re ever interested in trying a boarding-house novel, then I would recommend The Slaves of Solitude. It has also has that Britain-in-wartime vibe that adds an extra layer of poignancy. I have loved one or two of William Trevor later novels, but I’ve not got on so well with earlier ones.. I’d read mixed reviews of this one but you have me intrigued. This is definitely on the mischievous side in terms of tone, so I don’t know how you’d get on with it. Have you read Love and Summer by Trevor – I’m wondering if it might be one of the late novels you were referring to above? It’s more delicate and compassionate than The Boarding-House – beautifully written, too. I suspect you would like it very much. I am a Trevor fan although it’s been a while since I read any of his books. Have you read this one? If not, I think you’d like it very much. This sounds great Jacqui – as you say, a boarding house is fertile ground for a writer! I’ve only read Felicia’s Journey by Trevor, which I thought was excellent but I’ve not read anything since, thanks for putting him back on my radar! Oh, you’re very welcome. I think you’d like this one, the set-up allows for plenty of incidents between the characters and Trevor executes these very effectively. Plus it has that sense of social change as a backdrop, a household that knows it needs to move on. I haven’t read Felicia’s Journey, but I really liked the film version. Maybe I should pick up the book at some point. Then again, that’s always a risk when you come to the film first — it can be hard to get the characters’ images out of your mind! This sounds wonderful. Maybe it will be my next William Trevor! It’s great. If you have any interest in the great British boarding house, then this is the one for you. The characterisation is excellent. Hotels and boarding houses: great places to assemble an interesting cast of characters! Do you have a favourite, Lisa? I share your fondness of boarding house novels. I liked Girls of Slender Means very much. This sounds rather marvelous but then he is such a wonderful writer. I know I’d like it. The guy who listens to recordings of steam trains made me laugh. What is it with men and trains. In the Diary of a Bookseller Bythell writes that the railway books are always gone first. I really haven’t experienced enough by William Trevor, but everything of his that I’ve read to date has been wonderful. Mr Scribbin made me laugh too. I could just imagine him holed up in his room listening to those recordings of trains over and over again – everyone likes to have a hobby, some more obscure than others! I’ve only read one Trevor book, so many years ago that I can not even recall what it was. I do recall bristling at its depressing atmosphere, though, which I obviously found off-putting enough not to pick up another of his works. But this one sounds quite a bit more appealing, a microcosm, obviously, with Mr. Bird looking down god-like on his collection of curiosities. Onto the list it goes! Yes, the tone is very mischievous at times. Trevor has a lot of fun with these characters in what is essentially a kind of tragicomedy. As a slight aside, I couldn’t help but be reminded of that freshly translated Irish book you wrote about on your blog a few years ago, the one where all the dead souls in the cemetery are chattering away to one another – The Dirty Dust? It’s not quite the same thing — the language is not quite as close to the bone here — but something about the spirit of Trevor’s novel made me think of it. I think you might find it an interesting comparison!